This week’s book is all about beef too! 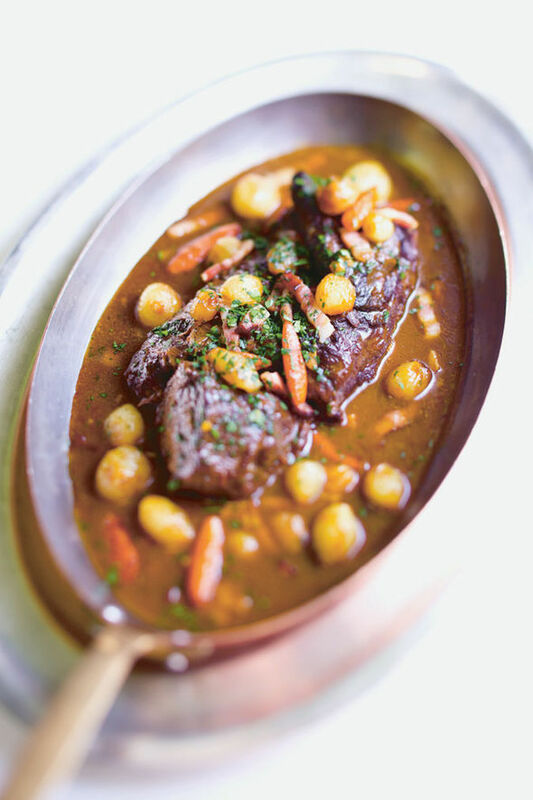 Beef & Potatoes by Jean-François Mallet has 200 recipes to enjoy. The two classics are ideal for a dinner party. Buon appetito! Season the beef with salt and pepper. Heat the oil in a large frying pan over medium-high heat. Add the meat and cook, turning, until browned on all sides. Transfer to a plate and allow to cool. Wipe out the frying pan. Peel and chop the garlic and shallots. Wash and chop the mushrooms. Melt the butter in the pan over medium-high heat. Add the garlic, shallots and mushrooms and cook, stirring, until any liquid has completely evaporated (the mixture must be quite dry). Season with salt and pepper and set aside to cool. Add the veal and mix well. Preheat the oven to 170°C/325°F/Gas Mark 3. Lay the sheet of puff pastry on a work surface and spread with the mushroom mixture. Place the beef fillet on top and roll up tightly. Place the wellington in a baking dish. Mix the egg yolk with 1 tbsp water and brush over the pastry. Cook in the preheated oven for 25 minutes. Once it is cooked and golden, remove it from the oven, cover with foil and let it rest for 5 minutes. Slice and serve with duchess potatoes. Peel and wash the potatoes and cut them in half. Put in a large saucepan of salted water over high heat and bring to the boil. Reduce the heat to low and cook for 40 minutes. Drain the potatoes and mash them, adding the butter in small pieces. Transfer to a medium bowl, add the nutmeg and season with salt and pepper. Mix with a wooden spatula to a smooth purée and set aside to cool a little. Preheat the oven to 200°C/400°F/Gas Mark 6. Lightly grease a baking tray with vegetable oil. Add the egg yolks to the potato purée one at a time, using the spatula to mix through after each addition. Fill a piping bag with the purée and pipe out small rosettes on the oiled tray. Cook in the preheated oven for 3-4 minutes, or until warmed through and golden brown on top. Bruise the garlic cloves in their skin. Peel the large carrots and slice into rounds. Peel and chop the large onion. Finely chop the bacon and soak it in Armagnac. Roll the pork fat around the beef. Preheat the oven to 170°C/325°F/Gas Mark 3. Heat 2 tbsp of the oil in a large flameproof casserole dish over high heat. Brown the beef on all sides and transfer to a plate. Add the garlic, carrot rounds, onion and bouquet garni to the casserole dish. Cook for 5 minutes. Pour in the wine and boil, stirring, for 30 seconds to deglaze the pan. Strain and reserve the bacon, adding the Armagnac to the pan with the stock. Return the beef to the casserole dish, cover with a lid and cook in the oven for 2½ hours. 3 minutes. Add the caster sugar and add water to almost cover. Cook until the liquid has evaporated, then reduce the heat to low and add the reserved bacon. Cook gently for 10-15 minutes, season and serve in a dish with the vegetables.